Do you know any Puerto Ricans? It's way more complicated than just "brown people want money" and the political divisions over their relationship with the mainland- which, let's admit, treats them pretty shabby much of the time- are not like you are representing. It's a pretty interesting topic. I knew they were a US territory but I did not know that made you a citizen. I thought it meant that the US will defend you at war and would give you aid when necessary. Also I am not claiming to have any real knowledge on this subject, I clearly asked in the OP whether or not I was right. (it appears I was wrong). I just don't get how they are considered citizens when they are denied basic rights guaranteed to US citizens in the constitution. Clarify this. That is an interesting concept. There are people all over the world that have never stepped foot in this country that have an American parent that are citizens that wouldn’t consider themselves Americans. Puerto Rico isn't represented in the electoral college but Puerto Rican people have the right to vote. They can just move to another state. Here are the main points on "PR American Citizens"
That makes sense. Like that pole volter kid from Laffy that competes internationally as for Sweden. Their corruption has dragged this out far longer than necessary. It's like when the mayor of San Juan was going on her anti-Trump rant about how they weren't receiving supplies while standing in from of pallets of food and water. 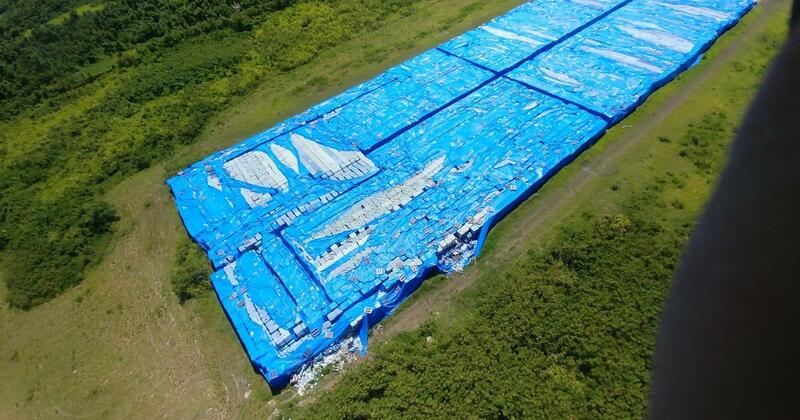 Here's half a runway covered in bottled water that the PR government never distributed. I knew they were a US territory but I did not know that made you a citizen. I thought it meant that the US will defend you at war and would give you aid when necessary. Also I am not claiming to have any real knowledge on this subject, I clearly asked in the OP whether or not I was right. (it appears I was wrong). I just don't get how they are considered citizens when they are denied basic rights guaranteed to US citizens in the constitution. this guy wrote a book on the territories which is mentioned in his article. It's a pretty good read. Wasn't Trump shooting paper towel rolls out the back of a truck at them like it was basketball?... borderline mocking them. I know theres a gif out there. damn...why wouldnt they distribute it? caught me off guard to see a Puerto Rican refer to herself and her country as "American Citizens". New York City is full of them. They can come and go as they please. Recently droves of them moved to central Florida. The Puerto Rican Campaign was an American military sea and land operation on the island of Puerto Rico during the Spanish–American War. The offensive began on May 12, 1898, when the United States Navy attacked the capital, San Juan. Though the damage inflicted on the city was minimal, the Americans were able to establish a blockadein the city's harbor, San Juan Bay. On June 22, the cruiser Isabel II and the destroyer Terrordelivered a Spanish counterattack, but were unable to break the blockade and Terror was damaged. We got it in 1898 in peace treaty. Also got Phillipines at same treaty. After ww2 we gave Phillipines independence. they're essentially a third world country and will remain so forever. Not like him. At all he was born here and grew up here. He’s an American. I mean say a man or woman leaves the country and moves to France, the uk, Germany...wherever...and never comes back. Then they have a family with someone from one of those countries and they stay there. The kid would be an American citizen because one parent is American, but they wouldn’t consider themselves an American. He would be what you are talking about from the Swedish POV though right? He's never lived in Sweden but he competes for them cuz his mom was born there.